Fascism and totalitarianism are two ideology-based authoritarian systems of political governance that could be found in their pure forms in certain parts of the world in history, and today those can be found to be working not in purity but in conjunction with other political ideologies. Fascism is much older concept of political ideology than totalitarianism. The term ‘fascism’ is derived from the Latin word fasces symbolizing power depicting a picture of rods and axes. The intellectual root of fascism can be found in the writing of some 18th and 19th century European voluntaristic philosophers like Arthur Schopenhauer (1788 – 1860) and Friedrich Nietzsche (1844-1900) of Germany, Henri Bergson (1859-1941) and George Sorel (1847-1922) of France and Gabriele D’Annunzio (1863-1938) and Giovanni Gentile (1875 – 1944) of Italy, all of them considered will as superior and must be preferred to intellect, logic and reasoning. The ideal fascist of modern history, Benito Mussolini (1883 – 1945) of Italy was particularly influenced by George Sorel and Giovanni Gentile. Sorel held that society has a natural tendency to decay and become corrupt, and an idealist strong leader must come up to arrest the down fall of the society and lead the mass. Gentile strongly recommended supremacy of totalitarianism state meaning total subordination of individual will and freedom to the authority of a leader representing the state authority. Ancient history has seen kings and monarchs of relatively smaller states wielding absolute power in state governance, but totalitarianism as modern history has seen in its full form came into existence only after World War I, after extreme right wing political parties came into power in Italy and Germany and communists took control of Russia. 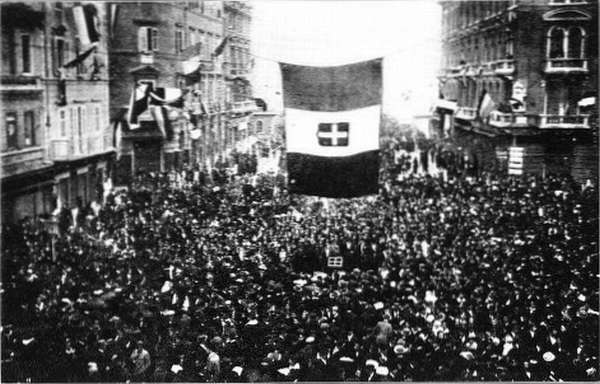 The term totalitarianism was used for the first time by Giovanni Gentile, in 1925 after Mussolini of Italy climbed to the throne of power. The concept of comprehensive socio-political system developed by Gentile was held in high esteem by Mussolini, but Hitler of Germany and Stalin of Russia used the term to criticize one another. However the term gained popularity in the aftermath of cold war, by US historians Friedrich and Brzezinski in their essay Totalitarian Dictatorship and Autocracy (1956). Although the two concepts are similar being authoritarian in nature and many a time used interchangeably, there lie some differences between the two. This article is an attempt to focus on the clear distinctions as well as the intermingling areas between the two concepts of state governance. Fascism is an extreme rightwing authoritarian concept, where the state or the race is considered as an organic community, where loyalty to the state is absolute and uncompromisable. The propagators of fascism instill a superiority complex and fear psychosis among the citizens against perceived enemies of the race or the nation as the case may be. As such the whole population is urged to stand behind the fascist leader in order to either protect the superior identity of the population or to defeat the enemy as perceived by the leader and his followers. The propaganda machinery of the ruling class tactfully scripts unquestioned loyalty in the psyche of the population to the leader, where individuals believe that personal welfare of individuals is subordinate to the ideological vision of the organic community. Totalitarianism is a political concept where all the resources within the geographical boundary of the state are monopolized by the state and the whole population is mobilized to champion the cause of the state represented by a monopolistic political party. Totalitarianism regimes aggressively take the role of guardian of the so called corrupt and immoral society and promise alternative form of government where the disorders of the society could be fixed. High decibel propaganda campaigns are undertaken by the regime to garner support of and dictate the citizens to come into terms with the regime. The state interferes with every activity of individuals and functioning of constitutional bodies, and thereby practically appropriating all civil liberties, in the name of state hegemony. Fascist regimes use secret police force and party cadres to spy against the citizens from indulging in anti-regime thought, speech, propaganda and activities and encourage selective violence against perpetrators of such acts. A fascist however need not be a totalitarian in that the leader may or may not be interested to curb individual freedom so long as it is not ultra-vires to the concept of organic community. All the societal spheres like education, sports, health, business etc. are infiltrated by party cadres through establishment of unions. Fascist regimes resort to secret killings and often genocide of so-called inferior hostile races. Fascist leaders often wear feather of internationalism into their hats by supporting ethnic cleansing across the border in the name of ideological and racial solidarity, as seen in some east European and African countries. Totalitarianism regimes, on the other hand mainly use government propaganda machinery to publicize the cause of the nation and spread half-truth or false stories about failure of other systems and success of the regime. Since state is held as sacrosanct and the party as custodian of the state, totalitarianism regimes resort to wide spread killing of its own people and justify the killing as inevitable to further the state’s interest. A fascist regime, as seen in history, may come to power via democratic means, but is ardent opponent to applied democracy, and as such wants to grasp all executive powers whether constitutionally approved or not. All the democratic or autocratic political forces in the society are ruthlessly suppressed by the fascist regime. A totalitarianism regime is more interested in authoritative power to curb civil liberty. Being the only political party in existence, the party in power can grasp all authoritative powers through constitutional mandate. History has seen a very fundamental difference between fascism and totalitarianism. While most of the totalitarian regimes have confined their activities within the geographical boundary of the state they control, fascist regimes have often harbored imperialistic ambitions. Fascist governments, all over the world have persistently given utmost importance to the race and community they belonged to. As such military planning has always superseded economic and other planning. Totalitarian governments have given importance to economic planning, though many a time putting the cart before the horse, along with military planning. Hitler and Stalin are the most classic example of this. Benito Mussolini (1883 – 1945) of Italy is a classic example of both fascism and totalitarianism. Hitler (1889 -1945) of Germany came to power through election and became the most hated fascist of the world, but he was never a totalitarian, as personal liberties of German Christians were never compromised at his behest. Other fascist leaders of the world worth mentioning are Hideki Tojo of Japan, Engelbert of Austria, Vargas of Brazil, Gonzalez of Chile, Chiang Kai-shek of China, Philippe of France, Antonescu of Romania, and Franco of Spain among others. The world has seen many other sporadic fascist movements and leaders all over the world many of them could never capture power. The list of totalitarian regimes of the world is also not too short. Some of the feared leaders of totalitarian regimes inflicting permanent injury to human society are; Joseph Stalin of Soviet Union, Benito Mussolini of Italy, Kim dynasty of North Korea, Mao Zedong of China and Castro brothers of Cuba. Fascism considers the race or the community as organic community, and holds individual freedom as subordinate to the interest of the race/community/nation. Totalitarianism considers the society as inept and corrupt and assumes guardianship of the society. Fascism beholds tremendous executive power to check and control any anti-regime activity. Totalitarianism grasps total authoritative power and tries to control every activity of the citizens and every function of constitutional bodies. Fascist regimes mostly depend upon secret police and party cadres to further their causes. Totalitarian regimes depend upon government propaganda machinery and military to achieve the cherished goals. Fascist regimes are more imperialist in attitude than totalitarian regimes. Benito Mussolini was fascist and totalitarian both. Hitler was the ideal fascist and Stalin was the face of totalitarianism. Fascist regimes gave more importance to military planning than economic planning. Totalitarianism regimes gave equal importance on military and economic planning. Difference Between Totalitarianism and Dictatorship. tapas. "Differences between Fascism And Totalitarianism ideologies and their applications." DifferenceBetween.net. June 14, 2017 < http://www.differencebetween.net/miscellaneous/politics/differences-between-fascism-and-totalitarianism-ideologies-and-their-applications/ >. No political agenda there, huh? Your definition of fascism is almost exactly opposite of right wing. You probably got off sucking your leftwing professors left nut to get a good grade. .